Ocean waves are created by the transfer of energy from the atmosphere to water. Most water waves are generated by wind moving over the water’s surface that creates fractional drag. The size of the resulting waves is dependent upon the wind velocity, wind duration, and the fetch (i.e., the area and distance over which the wind travels. In general, people think that ocean waves in deep water appear to be massive moving objects, like a ridge of water traveling across the sea’s surface. 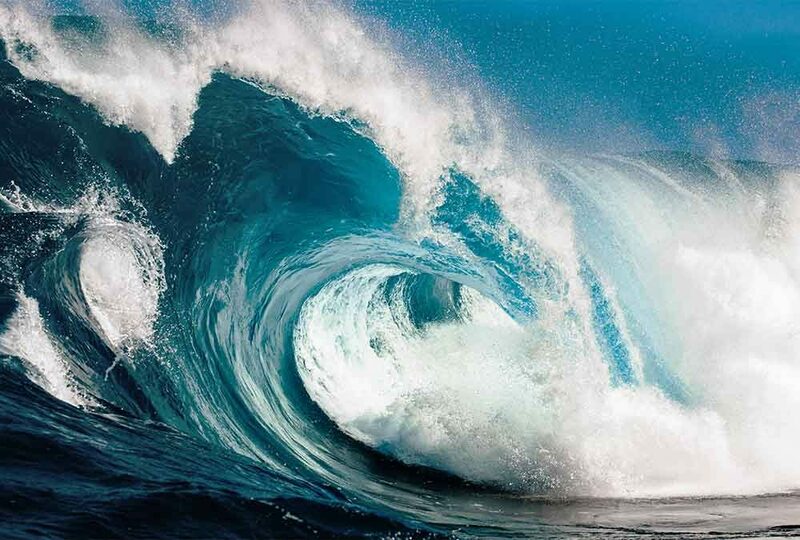 However, an ocean wave is one of several kinds of waves, all of which are disturbances caused by the movement of energy from a source through some medium (solid, liquid or gas). The traveling hump, or ridge of energy, produces the appearance of movement we see in a wave. In an ocean wave, energy is moving at the speed of the wave, but water is not. In general there are two types ocean waves; deep water ocean waves know as swell, and smaller waves on the oceans surface otherwise know as ripples. The water molecules within deep water trace a series of circles that extend below the surface of the wave base. Note that an object on the surface returns to the same position with the passage of each wave. This occurs if there is no current. The nearly friction-free transfer of energy from water particle to water particle in the form of circular paths, or orbits, transmits wave energy across the ocean’s surface and causes the wave form to move. This kind of wave is known as an orbital wave, a wave in which particles of the medium move in closed circles as the wave passes. Orbital ocean waves occur at the boundary between air and water, or at the boundary between layers of water of different densities. Because the wave form in these waves moves forward they are known as progressive waves. The wave crest is the highest part of the wave which is above average water level. The wave trough is the valley between wave crests which are bellow average water level. Wave height is the vertical distance between a wave crest and the adjacent troughs, while wave length is the horizontal distance between two troughs. The time it takes for two successive wave crests (or troughs) to pass a fixed point, usually measured in seconds, is known as the wave period. Wave frequency is the number of waves passing a fixed point per second. Frequency is the inverse of period. Importantly, the deeper water is off a shoreline, the further into shore waves can move before they begin to “feel bottom” and break. So erosion along a shoreline well tend to be greater if relatively deep water is found immediately offshore. In contrast, a wide beach results in waves breaking far offshore and the expenditure of wave energy moving beach sand around rather than eroding a dune, bluff, or cliff. Ocean waves are classified by the disturbing force that creates them, the restoring force that tries to flatten them, and their wavelength. The energy that causes ocean waves to form is called a disturbing force. Restoring force is the dominant force trying to return the water surface to flatness after a wave has formed in it. During storms, the wave heights increase while the wave lengths decrease. Wave heights during storms may exceed 10 meters (33 feet)!! These waves are extremely dangerous to any boater or surfer out on the water. So, stay out of the water during severe storms. The wave length during storms tends to decrease; some may be as small as 15 meters (50 feet). Long-shore currents can sweep swimmers and surfers into rip currents, piers, jetties, and other hazardous areas. In many cases, the long-shore current is strong enough to prevent swimmers from being able to keep their feet on the bottom, making it difficult to return to shore. Always check with the lifeguard on-duty before you enter the ocean to consider the direction and strength of the long-shore current and the possible hazards you may be swept into.